The Surrey Eagles will host the Merritt Centennials this afternoon at the South Surrey Arena in the first of two games between the teams this season. The Birds and Cents only faced each other once in the 2011-12 campaign. Merritt picked up a 2-0 win on October 21, 2011 at the Nicola Valley Arena. The Eagles enter tonight's action on a two game losing streak, although the first of those two losses was in double overtime. It's the first time Surrey has lost two in a row this season. Despite the losses, Devon Toews has been a bright spot of late for the Birds, scoring in his last two games. The 18-year-old leads Eagles defensemen with six points in nine games this year. Merritt is playing its third game in as many days and is coming off a 5-1 loss to the Alberni Valley Bulldogs on the island last night. It was only the second regulation loss of the season for the Cents, who sit in second in the Interior Division. Rookie defenseman Dane Birks has had a good start to the year for Merritt, putting up nine points in seven games. The Williams Lake native will be attending Michigan Tech beginning in 2014. 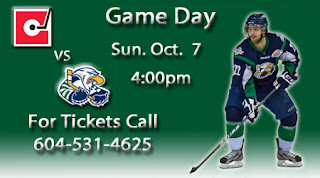 How to listen: http://ustream.tv/channel/surreyeagleshockey or on 88.7FM in the arena.